into the international economy. However, these developments also pose new challenges to enterprises and Governments, and redefine the framework for business-government and government-to-government relations in the context of regional cooperation in the subregion. 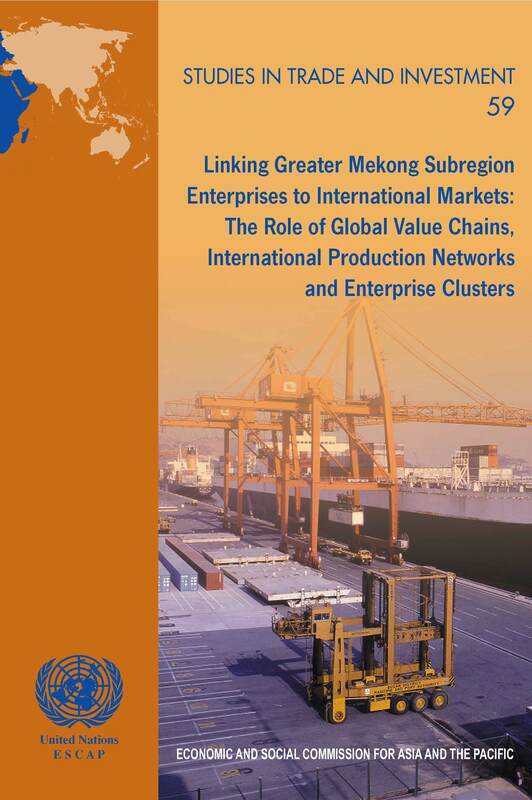 Global value chains and production networks are creating an international economy increasingly characterized by fragmented and specialized production dispersed across borders. This can provide opportunities for smaller enterprises to enter into large-scale exports and build new competitive capabilities by concentrating on a few core activities, or to focus on specialized outputs for niche markets that may be regional or even global in scale. Although individual SMEs may face significant constraints in responding to such opportunities, cooperation through enterprise clusters could provide a potentially effective mechanism to achieve collective efficiencies through joint action and support the participation of GMS enterprises in global value chains. The transformation of international business and the global economy through the emergence of global value chains and associated production networks can provide new directions for GMS cooperation in linking enterprises in the subregion more effectively to international markets. Such cooperation can build on existing GMS initiatives in areas such as transport and trade facilitation to address specific cross-border opportunities and constraints in industry value chains of shared interest. This can expand significantly the benefits of development through cooperation in the Greater Mekong Subregion, within the framework of an evolving regional and global economy.